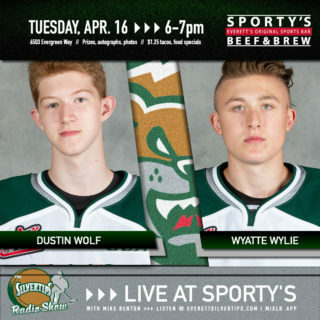 Two former Silvertips participated in Game 7 of the French Ligue Magnus finals with the Dukes of Angers (Les Ducs D’Angers) on Tuesday. 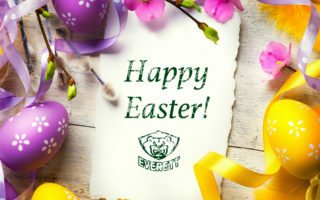 Longtime Silvertips Associate Coach Jay Varady (with Everett 2003-11) is in his second season as Head Coach of the Dukes, while former Everett Captain Jonathan Harty (2004-08) is a defenseman for the club. After finishing first in the regular season rankings and advancing to Game 7 of the finals, Angers fell 4-3 in overtime to the Rouen Dragons – who won their fourth straight Ligue Magnus title. Defenseman Shaun Heshka (2003-06) has a shot at a league Championship in Finland next week after advancing to the SM-Liiga finals with the Pori Aces (Ässät Pori). Heshka, who has three points (1g/2a) in ten playoff games, and the Aces earned their second straight five-game series victory on Monday to advance to the final series vs. Tappara Tampere. Game 1 is set for Monday. Forward John Lammers (2005-06) was among the top scorers in Austria’s Erste Bank Hockey League this year with 67 points (29g/38a) in the regular season. Lammers and the Klagenfurt Athletiksport-Club then won their first two playoff series in five and six games, respectively, before completing a four-game sweep of the Vienna Capitals to win the league championship last Friday night. Congratulations, John! Tampa Bay defenseman Radko Gudas (2009-10) was right in the middle of a testy affair Thursday night between the Lightning and the Pittsburgh Penguins. Gudas racked up 16 minutes in penalties for his role in the rough stuff that broke out in the third period of a 6-3 Pittsburgh win. CLICK HERE for more on the fracas. Former Silvertips Captain Landon Ferraro (2010-11) and the Grand Rapids Griffins currently sit in third place in the Western Conference, holding an eight-point Midwest Division lead over Milwaukee. Ferraro is the Griffins’ fourth-leading scorer with 41 points (21g/20a) and tied his career high with three points (2g/1a) in a 4-1 victory over Abbotsford last Friday night. Longtime Silvertips great Shane Harper (2005-10) has returned to the Adirondack Phantoms after a dominant 15-game stint with the ECHL’s Trenton Titans. After racking up 14 goals and 27 points in those 15 games with Trenton, Harper had points in his first two games back with the Phantoms, including a game-tying goal late in regulation to help Adirondack earn one point in a 3-2 OT loss to Wilkes-Barre/Scranton. 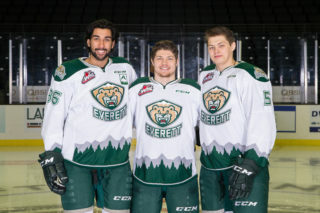 Four former Silvertips are currently battling in the same ECHL playoff series as Taylor Ellington (2004-09) and Josh Birkholz (2010-12) of the #2-seed Cincinnati Cyclones face-off against Byron Froese (2008-10) and Kent Simpson (2008-12) of the #7 Toledo Walleye in a first-round Eastern Conference matchup. Birkholz has two goals in the series and Ellington has one as the Cyclones hold a 3-0 series lead, while Froese leads the Walleye with two goals and Simpson has started all three games in the Toledo net. Game 4 is Friday night in Cincinnati. Former Silvertips forwards Brady Calla (03-07) and Riley Armstrong (03-04) also went head-to-head in the first round of the ECHL playoffs. 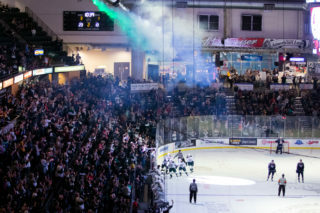 Although Calla and the Ontario Reign (seeded second in the Western Conference) won Game 4 on Saturday to sweep the #7 Utah Grizzlies, Armstrong won the former-Silvertip scoring battle and led Utah with three points (2g/1a) in the series. Goaltender Thomas Heemskerk (2008-10) and the #8-seeded San Francisco Bulls are in action Friday night in Game 4 of their first-round Western Conference series against the top-seeded Alaska Aces. Heemskerk has started all three games in the series and posted a 32-save shutout in the Bulls’ 1-0 win in Game 2. San Francisco trails the series 2-1. Forward Chris Langkow (2009-10) has two assists in three playoff games for the South Carolina Stingrays, the #6 seed in the Eastern Conference. The Stingrays trail the #3 Gwinnett Gladiators 3-0 with Game 4 set for Friday night as well. That concludes this week’s alumni feature, but check back for more weekly updates on even more former ‘Tips throughout the remainder of the 2012-13 season and playoffs around the hockey world. 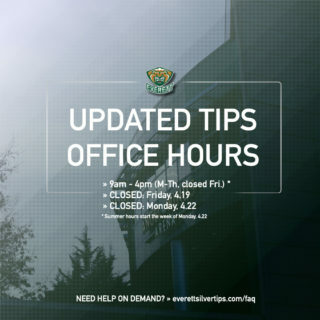 To keep up on all the latest Silvertips news, Like us on Facebook and follow us on Twitter.